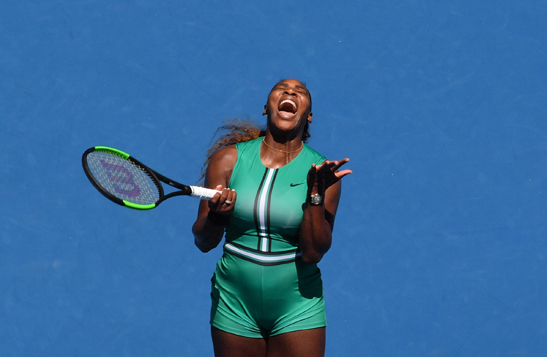 Melbourne—Serena Williams denied choking after falling victim to one of the greatest ever comebacks Wednesday, saying she was powerless as Czech foe Karolina Pliskova “just went crazy” to storm into the Australian Open semi-finals. Williams had Pliskova on the rack serving at 5-1 in the third set but the seventh seed fended off four match points to bounce back and end the American’s latest bid for a record-equalling 24th Grand Slam. The 37-year-old made a slow start and conceded the first set but had recovered and looked set for a hard-fought win before a desperate Pliskova went on the rampage. “She was killing me... I was almost in the locker room, now I’m standing here as the winner. It’s a great feeling,” an exhausted Pliskova, seeded seven, said after the two hour 10 minute epic. Pliskova, who will play Japan’s Naomi Osaka in the semis, was on the brink until Williams double-faulted with the end in sight. The 37-year-old, a seven-time Australian champion, then failed to win a point on serve for the rest of the match. The elated Czech rated it the best comeback of her life and said she always believed she could beat the American legend. “I know she’s the greatest ever, but I don’t want to put her somewhere where I would not have a chance to beat her,” she said in explaining how she approached the match. Williams said there was nothing she could do against an opponent in such form. Williams, seeded 16, had blazed through the early stages of the tournament, seeing off world number one Simona Halep in the fourth round. But against Pliskova she lacked the intensity she had previously displayed and was soon trailing for the first time during her campaign after a slew of uncharacteristic errors. The American said it was a lesson to not take anything for granted on match point. “This is when you go psycho, when you have match point... just go bananas on it,” she said. Pliskova, who entered this year’s tournament on a high after winning the Brisbane International warm-up, came out firing and bested Williams on serve to take the first set. Williams rebounded in the second before imploding in the decider. Former world number one Pliskova has made the quarter-finals in her last two appearances at Melbourne Park and made the final at the US Open in 2016. She has been a regular in the second week of Grand Slams in recent years, reaching the quarters or better six times since late 2016, but is still searching for a breakthrough win. The Czech said the win over Williams was a huge confidence booster before facing US Open champion Osaka. “She’s dangerous but nobody is more dangerous than Serena,” she said.